Sewing a wardrobe in a weekend ? Here are some skirts (a surprising number of skirts) and pants which the pattern companies think we can sew in 1 or 2 hours. From plain to frivolous. Even the fanciest of these skirts will go with most of the tops in my previous post. Though it wouldn’t be to everyone’s taste to wear them with all the speedy jackets in my planned post on layering pieces. There are also several super quick skirt and pants patterns in the wardrobe patterns I listed earlier. Many people start their dressmaking career with a dirndl skirt – cut a strip across the width of fabric, sew it into a tube, and turn over top and bottom for elastic waist casing and hem. If I was really under pressure I think even I could do that in less than an hour. If you’d like some helpful guidance with this, there’s Kwik Sew Kwik Start 3765. Simplicity 2368 is a 1 hour of sewing time skirt pattern including dirndl and 4 gore styles. There are some interesting possibilities that take 1 hour of sewing time, though they do need more sewing skills. McCall’s 5430 is a 1 hour wrap skirt with ties. oop McCall’s 3145 is a 1 hour sarong style wrap skirt. Silhouette 2050 is a wrap skirt with darts and button closure but no vertical seams, which they say takes 1 hour. Simplicity 2611 is a 1 hour pattern for skirts and pants. 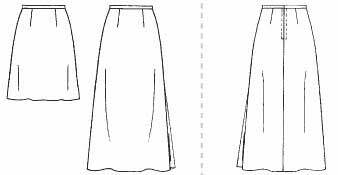 There are several oop skirt patterns which show what the pattern companies think you can achieve if you can spend twice the time on your sewing. There’s even a classic skirt with a fitted waist. oop McCall’s 2029 thinks we can sew darts, zip and waistband in 2 hours. There’s also a skirt with a side opening : oop McCall’s 4875 flared skirt. 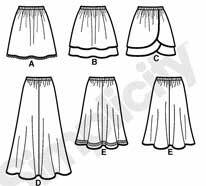 The other 2 hour skirts all have elastic waists. They use the extra sewing time on more complex pattern pieces. oop Butterick 5043 is for 2 hour tiered skirts. oop McCall’s 5140 has lots of 2 hour flared skirts. 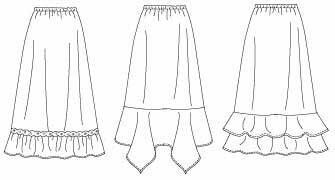 oop Butterick 4993 has 2 hour skirts with added frills and flounces. The super quick and easy pants all have elastic waists. McCall’s 5889 pattern for 1 hour tapered leg pants includes several lengths. Leave off the lower casing if that doesn’t suit you. If you’re not using a soft drapey fabric, you may find you need to cut a smaller size at the side seam, as there is a lot of fabric over the hips. If you prefer a straight leg, there are many possibilities. It must be difficult to have a pattern stash without acquiring several elastic waist pants patterns. Butterick 5044 are one-seam straight legged pants said to be very easy. I know many people love one-seam pants. I’ve made these and they are very quick. But I have a curved hip silhouette, and one-seam elastic waist pants really are not flattering on me. I need a side-seam to echo my shape. What’s best for me is a properly fitted waist with zip, but I’m yet not up to making them in a couple of hours ! Butterick 5153 has similar 1 hour drawstring pyjama style pants and shorts, sized for all the family. McCall’s 6129 is for 1 hour shorts, again for all the family. McCall’s 6082 is a 1 hour pull-on pant pattern for knits from Palmer-Pletsch. 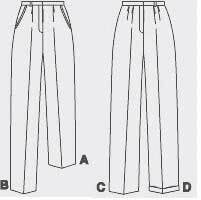 For ‘proper’ pants, there’s even oop McCall’s 4459, a Palmer-Pletsch pattern for 3 hour classic pants. The super quick patterns are not to everyone’s taste. And elastic waists are not the most flattering fit for anyone with an indented waist. All those bumps over your curves (and in my case adding to my high hip lumps. . .) If you have an indented waist and want to make quick bottoms, you pretty well have to wear elastic waists under a loose fitting top. Or use very soft fabric with no body, so the gathers lie flat instead of bubbling up. But these patterns do show the sort of processes you can use if you want to finish speedily. oop McCall’s 2029 is a pattern for a skirt with darts, zip, and waistband, in 2 hours of sewing. Obviously they think those processes will only take you one extra hour of sewing. Is this actually possible ? This entry was posted on June 6, 2010 at 7:17 am and is filed under speedy sewing. You can subscribe via RSS 2.0 feed to this post's comments. Both comments and pings are currently closed. I have never timed myself cutting out and sewing something like simple pants. I have never sewn a wardrobe with a game plan, I’ve never shopped for rtw that way either! I am intrigued, and it sounds like such a *good* idea. But, alas, I know myself. I am unlikely to get very far. The first hurdle is finding suitable fabrics, much harder than sourcing patterns, I find. Then, I usually run out of steam before I can get it all sewn up, and then the season changes on me! When I sew myself I just keep in mind an overall scheme of what I wear, what I need, and what my best shapes and colours are.